I’m Amélie, French wedding planner based in Montpellier, in the South of France, but I move wherever beautiful stories take me. I’m from Reunion Island, I’m a globetrotter and have a multicultural background. Every wedding are different and I provide bespoke services. 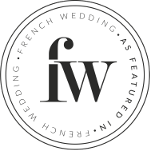 You dream of a wedding in a Bastide in Provence among the olives trees and lavenders fields OR of a wedding in a french Château surrounded by vines, everything it’s possible. I will accompany you through each step and bring you the expertise to make sure it happens. We will take our time together to think and to refine every last detail of your big day. Respect and trust will be the basics of our mutual understanding.